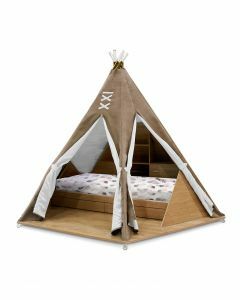 The Teepee Luxury Play Tent has a playful design influenced by the Disney princess Pocahontas and her free-spirited and highly spiritual personality. Kids will be drawn to this play tent because of the connection to nature that it inspires. It is supported by a 5-pole structure with acrylic finishes with a covering in synthetic cow skin print, with peach skin texture.This play tent is a must-have for kids’ rooms and will keep them entertained for hours and serve many purposes for kids’ activities. The play tent measures 60'' Diameter x 55''H. Click images for greater details. Every part of this kids play tent is hand-crafted and hand-tailored using the finest materials. For cleaning it is recommended to use only a water based cleaning agent and a soft, lint-free cloth. The production time for this bed is 10-12 weeks. Please note that this specialty play tent is custom made to order and may not be returned. Please e-mail Customer Service with any additional questions.